Features: Clerodendrum thomsoniae is an attractive bushy, tropical looking twining vine with glossy dark green ovate leaves and gorgeous flowers in clusters of 8-20 together, resembling a group of dangling hearts. Each flower has a pure/creamish white five-lobed calyx and a crimson five-petaled corolla. The flowers are quite long lasting with their white sepals gradually changing to light purple as it withers off. Occasionally, fruits develop in shade of green and blacken as they ripen, with four black seeds within that can be used for propagation. Usage: It is grown on ground or in containers as an ornamental plant for its decorative two-coloured flowers. As a twining vine, it’ll be great to cover the chain-link fence, or grown over arbors or trellises to display its spectacular blooms! Attracts bees and butterflies to your garden! 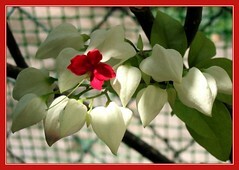 Care: Since Bleeding Heart blooms on new growth it is best to cut them back after blooming. Give plenty of water and fertilize fortnightly when actively growing. 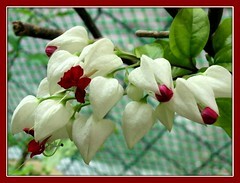 Provide it with lots of light or morning sunlight to promote flowering. Though a vigorous grower, it does shed its leaves occasionally, leaving a trail of ugly twigs behind! So, give it a hard trim (not too hard though to shock it into dormancy!) to promote new sprouts that will result in more blooms. For Temperate Regions: Check this link for more plant information. We were very impressed with this Bleeding Heart plant when we first saw it at a nursery about 4 years ago. Just a small plant about 1 foot tall with a cluster of the most beautifully formed almost perfect white hearts and bloody-red flowers that contrasted wonderfully against their green leaves! So we brought it home, planted in on the ground and train it to climb over a discarded 2.5 (L) x 1.5 (W) x 2.5 ft (H) aquarium stand. A vigorous vine that soon scrambled all over with their lush green leaves one season and the next almost devoid of leaves, leaving unsightly twigs ‘everywhere’. Flowers were few and far between too! :( Thinking that it wasn’t happy with its home which is also water-logged during wet seasons or too exposed to the scorching sun, we removed it, replanted in a large container and positioned it next to our backyard chain-link fence. Sadly, it died (maybe the shift was too traumatic!) but fortunately it produced a young plant at its original home either from seed or suckers. Of course, we carefully transferred that seedling to our backyard and it flourished very fast. Then, the same sad case of lush green growth followed by shedding of its foliage and just a couple of blooms! So, I trimmed it hard, right down to less than 1.25 feet of leafless trunk, hoping for new branches and blooms. Thereafter, it appeared almost lifeless for many months, without any sign of new growth for what seemed like eternity! A few weeks ago, we weren’t sure whether our Clerodendrum thomsoniae can survive further, seeing that it’s just two ‘dead’ trunks with a few leaves and 2 clusters of blooms! But a month later today, I see more new leaves, new growth with some small signs of blooming ‘hearts’ at stem terminals too, as well as the 2 clusters of last month’s blooms about to finally wither off (how lasting they are!). How wonderful, this plant had survived a very hard prune! Praise the Lord! In future, I think the wiser move will be to prune the vine more frequently on semi-hard wood to promote branching and blooming. Avoid drastic pruning on very old twigs that have been left unchecked like juvenile teenagers, as this may traumatize the plant or snuff it off! Hi – this is a mail from India . I saw a bleeding heart vine yesterday at a nursery and fell in love ! I bought it / and have kept it in my balcony. It is so pretty .. It gets plenty of sunshine ; I hope it lasts and likes India !! Is yours around still ?? Bleeding Heart vines are supposed to do that – they die back completely during Winter, then re-emerge. So don’t toss it out just because it looks to have died; wait a couple of months. Very unnerving, but it’s just their thing! :). I have just been given a beautiful bleeding heart vine currently in a pot which will soon be too small. I will repot it and probably put it in a covered terrace protected on 3 sides. I live in the South of France and wonder if it will survive the winter outside. Although we have lots of sunny days in winter the temperature overnight can drop to almost zero. Will it be necessary to bring it indoors during a colder period? Its so beautiful that i cant off my eyes, how can i get this plants in plug/flat and shipped to texas? Yes, they can freeze. I live on the coast in south Texas and we just survivied a very hard winter. We had 4 or 5 hard freezes and it actually snowed. I completely lost all 3 of mine. I just ordered a few more for the new growing season. Cover them or take them inside if possible during the hard winter months! Hi there could I keep these in an aquarium, not fully submerged… Just the roots?